I decided it has been far too long since I have entered a competition, sent in a submission, participated in a swap or been published. So, before christmas I noticed that Australian Simply Cards was running a competition with great prizes on offer, the rules were a little hard to work out but with the help of the lovely Judy who was also going to enter and got in touch with the magazine to clarify the rules we were on our way. 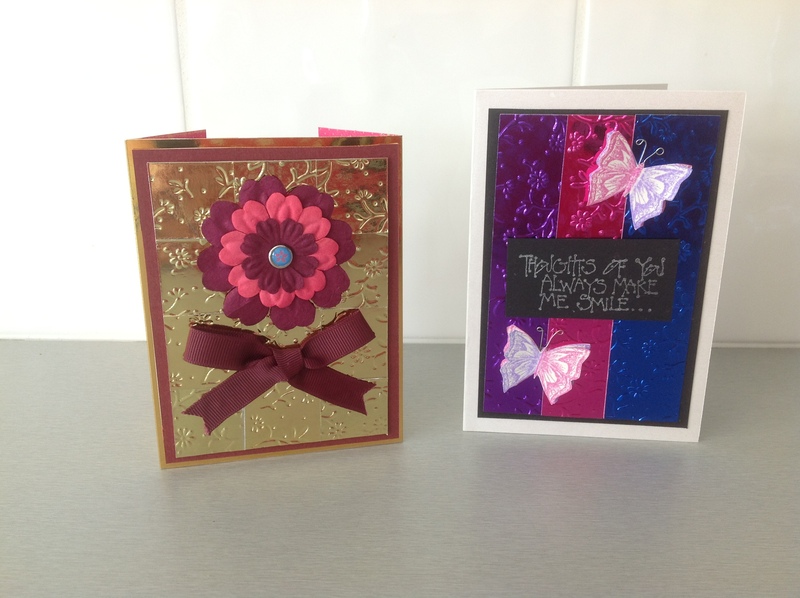 It was great to be challenged, you needed to have an advanced, intermediate and beginners card using embellishments, stamping and new techniques and using materials currently available so recent acquisitions only. Oh dear I thought perhaps this was too challenging for my first go. As I have blogged previously I love the effect of embossing on standard foil board and really don’t understand why more people aren’t using it so I decided this was to be my base inspiration. I came up with three separate cards, two of which are shown below. The first card is a reverse gatefold with a nine patch “right” and “wrong” way gold foil embossed base with Kaiser Craft flowers, brad and ribbon. 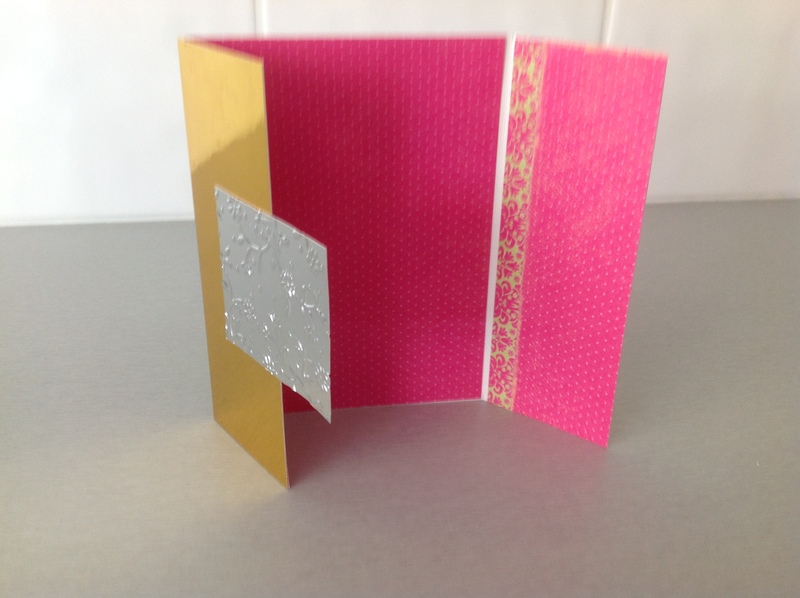 The reverse has coordinating kaisercraft paper and a silver foil embossed square with a velcro dot to hold the card closed. The second one uses my beloved butterfly stamp, definitely not one that is still in production by many others are available on the market. Using a rainbow stamp pad I stamped 4 butterflies and layered them up on some curled wire which I shaped into antennae’s and mounted on coordinating strips of embossed foil board. Even though these were returned to me and I didn’t win I was very happy with the results. It also made me realise that I have been so bewitched with all the beautiful embellishments you can buy now and my die cutting machine that I had forgotten all about watermarking, embossing and all the stamps I own. So I am off to have a stamping session – pulling out some of my old favourite stamps, stamping them with archival ink of watercolour paper ready for me to colour when I am next in need of some inspiration.